An exploration of time and man as a robotized tool in the beginning of the industrialized era (and now). Henry Ford who was very much one of the pioneers of mass production and the assembly line in the making of his first car the Model T, revolutionized the manufacturing system of the time. Technology was incorporated as a tool to improve the social mobility of his labor force (besides lowering production costs etc..) and his 'Fordism' aspirations took in to account (basically) the well-being of society as a whole..
p.s. This is at least what I had learnt from earlier research, however I have just recently discovered a little more on how he managed his workforce and about his somewhat anti Semitic leanings.. It was true that he paid extremely good wages for the time, which is why the jobs he provided were highly sought after, despite the fact he demanded a very high degree of discipline, even after work hours, from his men. He also used covert & overt tactics to quell dissent within his workforce however, including spying and rather heavy handed dealings to stifle any efforts at forming labour unions.. He would have loved the complete mechanization of his workforce, I'm sure. This was a double experimental piece for me. Firstly, I'd never painted on plasterboard (my own DIY attempt at recreating clay-board, that I recently heard about and wanted to try ( I've never seen them sold here, so I just mixed some plaster of Paris with PVA glue in to a syrupy concoction and laid it on board. Didn't bother about getting it smooth for I wanted to try a more textured surface)). Secondly, It was my first attempt at Maxfield Parrishs unique glazing technique (glazed layers of oil separated by varnish, which was usually laid over a blue under-painting). First an initial blue under-painting in watercolour was laid. Then alternate layers of coloured glazes and Retouch Varnish were applied using as little medium as possible. Applying the paint and then removing, leaving a very thin yet concentrated layer each time (still transparent). In the end 6 layers of coloured glaze was applied in between layers of Retouch Varnish) till it was complete! 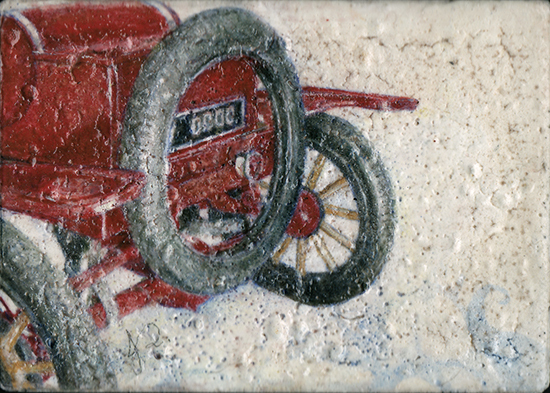 texture of this piece are just beautifully recreated in these fine art prints. Sizes start from 8 x 5.63 Inches and are available on a variety of supports ..